Did You Buy a New Dust Extractor, Tools, or Accessories for OSHA Table 1 Silica Rule Compliance? ToolGuyd > Editorial > Did You Buy a New Dust Extractor, Tools, or Accessories for OSHA Table 1 Silica Rule Compliance? Did you buy anything to bring your masonry work in compliance with OSHA’s respirable silica rules? This section means this respirable crystalline silica standard, 29 CFR 1926.1153. (c) Specified exposure control methods. (1) For each employee engaged in a task identified on Table 1, the employer shall fully and properly implement the engineering controls, work practices, and respiratory protection specified for the task on Table 1, unless the employer assesses and limits the exposure of the employee to respirable crystalline silica in accordance with paragraph (d) of this section. Most employers and workers will likely opt to adhere to Table 1 guidelines rather than go through the process or measuring and assessing the exposure levels. That’s why you’ll see “Table 1 complaint” mentioned in product descriptions, fact sheets, and informational flyers. But for those who have the means and interest in measuring silica exposure, there are additional products that might be suitable despite not being Table 1 compliant. Even if your work doesn’t fall under OSHA safety oversight, you should still consider following the guidelines in order to protect yourself from respirable silica hazards. Human lungs are not meant to deal with silica. In order to be compliant – or safe – you general need your tool – and chances are you won’t need to buy a new one – a compatible shroud or accessory, and a good vacuum or dust extractor. Some tasks require HEPA-rated filtration. Table 1 spells out exactly what you need. Dust collector must provide the air flow recommended by the tool manufacturer, or greater, and have a filter with 99% or greater efficiency and a filter-cleaning mechanism. Use a HEPA-filtered vacuum when cleaning holes. Table 1 also provides guidelines for minimum respiratory protection. NOTE: I’m not a safety expert – all information here is for convenience and not safety or medical reference. I have not really heard from anyone about the new OSHA guidelines and Table 1 compliance requirements. I’ve heard a lot from tool brands, but not professional users. These questions are some of the things I’ve been wondering about and hoping to see your thoughts on. 1) Did you know about all this already, or at least in some capacity, or is it completely new to you? 2) To you believe yourself to be in compliant with Table 1? 4) What did you buy? 5) What will you buy? 6) Do you think that tool brands and retailers have done enough to inform you of the new OSHA silica rules? 7) Will you attempt to adhere to OSHA guidelines? 8) If not, why not? These links are to Amazon, except for the DWV010, which links to an Acme Tools listing. With it being priced at $350, a lot lower than other vacs, it’s unsurprisingly sold out at Amazon and backordered at Acme Tool, with an Oct 30th ETA. I realize that there might be some strong opinions. All opinions are welcome, and I remind everyone to please be polite and steer clear of politics. Working on a Hardie board (cement board) siding job as I type this and we picked up a Bullet Tools EZ shear https://www.amazon.com/gp/aw/d/B008PQQ3N4/ref=mp_s_a_1_12?ie=UTF8&qid=1507220695&sr=8-12&pi=AC_SX236_SY340_FMwebp_QL65&keywords=bullet+tools for this job specifically to cut down on dust and speed up work, while we still need to rip with a table saw and make some circular saw cuts we do have 3M full masks. I’m sure we aren’t in full compliance but steps are being made. Anything is better than nothing. I hate breathing in that stuff. Plus it just makes for a cleaner job/product. I am curious about this rule, as I work retail where there is constant cement dust from broken bags being spread around. I know the MSDS for Portland cement says it contains small amounts of crystalline silica so the fact that this is constantly being stirred up and floated through the air makes me wounder how compliant hardware stores are with these OSHA dust rules. walk into any Lowes/Home Depot and look at the products near their cement isle and you will see a layer of this dust on everything, so it is being stirred up anytime anything moves. I was telling Stuart today that I saw a guy jack-hammering out some concrete in front of Cub (grocery store). Their solution was to have a guy with a hose spraying water on the rubble every once in a while. I have had a Fein hepa vac setup for over a decade. Dust, or not generating any, has long been a target of mine, either working on my own projects or working for others. It only took one unhappy customer many years ago to set me on the path of minimizing my cleanup issues and limiting airborne contaminants. I have purchased a couple of dust shrouds for one of my grinders in the last year or so, but it was before the new guidelines were advertised. As I am only working for myself these days, I will probably not make any special efforts other than that for the time being. I work in insurance, haven’t delt with work comp for a few years, but in general OSHA is well behind the standards of even fairly lax/tolerant work comp insurance carriers. Workers comp can be a 10 to 20% addition to construction payroll, to be competitive on bids, controlling that expense is a significant goal. And as such, compliance with safety standards of your insurance company (of which dust control is thing) is something the mid-size employers have been doing for years. And any large employer who’s self insured for work comp would have a huge incentive to prevent the enormous potential cost of chronic lung conditions. Given the problem is not something that’s just been discovered, most employers looking to persist as a going concern have been compliant in effect if not letter for quite some time. All that said, people who are in the business of producing silica dust have mostly been compliant for quite some time. It’s everyone who does it sporadically…like say the HVAC guys who occasionally bore through a basement foundation…that aren’t and probably still aren’t because it’s inconvienient to plan for a sporadic need…they’re also least likely to ever be cited and they know it. Bring you own PPE to work if your employer isn’t on the bus. I was thinking about the new concrete regs yesterday when a general labor contractor we use was cutting a trench for some electrical repair. His helper was cutting across the asphalt road using a normal 14″ gas handheld saw and putting out a giant plume of dust. Probably asphalt and dirt with a bit of blade. He wasn’t wearing anything, I would have been at least wearing a n95 dust mask. There was a decent breeze so not too bad for operator. We used to have a guy with a backpack blower pointed at the guy with the concrete saw. I’ve had a vacuum accessory for my concrete drill for the last 10 years riding around in the truck. Came free with it and that’s all I plan on doing. Sometimes I’ll use it, didn’t today and neither did the carpenters since they didn’t have anything either. Don’t really care about silica dust, just breathe through your shirt and put your purse down. If it looks bad for you, it probably is, use common sense and a mask. Now we’re supposed to have thousand dollar drills and thousand dollar shop vacs – good luck getting compliance. Enforcement will be a joke as well – maybe not in the big cities, but in the country none of that matters. We bought a bosch hpd200. We basically never drill concrete but had one job this year which required a 1″ hole drilled 50 times and wanted to make sure we were doing it right so i looked into dust exctractor and the bosch was a perfect fit for us. Ya ya i know wear a P100…. but if you have a hepa vac and a P100 isnt required how likely are you to have one on your jobsite? Sorry! The queue is currently 1-1,000+ days. I don’t remember the question in an email, and looking in my inbox I only see that I never got back to you about a 2-for-1 grinder deal at Home Depot. I meant flagged the email for further investigation and response, and am sorry that I fell behind on it. I have a bunch of older emails from the couple of months right after my son was born. That was the start of my response time going from “very quickly” for most emails, to “immediate or almost never” for most. Questions and requests in comments are even harder to track. I have 5,329 starred emails in my inbox, and 17,490 that are were read and then saved as new. My catch-up process will hopefully start this winter, along with post and review frequency. It’s really not my intent to ignore emails, questions, or requests, I simply don’t have the time to keep up with everything these days. You could use disposable bags when possible, but I believe it’s recommended that canisters be emptied into larger containers outside, carefully while wearing respiratory protection. I wonder if a Dust Deputy or similar would make things even better, although might that effect airflow so as to make a vac non-compliant? Haha its all good. upon review i sent it from another email address on 4/23/17 @11:25am. When we were doing our project on a brand new sports arena we had a lot of eyes on us. Another contractor that was walking by. He had never seen such an attachment and also had no idea about the new osha regs for silica. Many people are upset by the new requirements but silica is an extremely dangerous particle. On par with asbestos. Compliance will be difficult at first but will become easier as time goes on. We already use water with our Stihl 800 saw and our Hilti core drill. We are looking at the dust extractor for drilling to work with our DeWalt Hepa vacuums. To answer the question about emptying the vacs, they must have approved bags and use approved reperators as needed when emptying. Husqavarna has released a series of vacuums that are very impressive. I’m thinking about their slurry vac as it not only can be used with a bag, it also has a built in pump that can send the slurry to an off board container. The larger challenge will be for grading contractors and the silica they encounter from dumping materials, grading, etc. We will see what happens on that end. where did festtool land with their vacs from the past several years? Sufficient ? 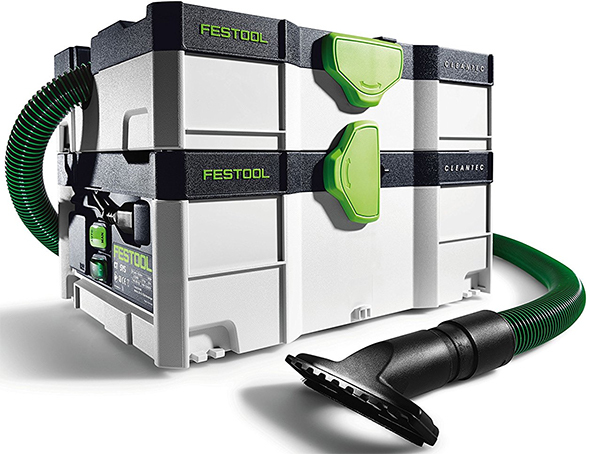 Festool, as per their website and twitter feed, does not currently make any vacuum that is Table 1, or concrete, compliant. Also, ANY vacuum that you use must have a self-cleaning mechanism (designed into the vacuum itself) to be compliant. You just cannot go out and buy a HEPA filter and put it on your existing vacuum and be compliant. Basically you’re going to have to fork out around 600 clams for a vacuum. No Hilti information!? 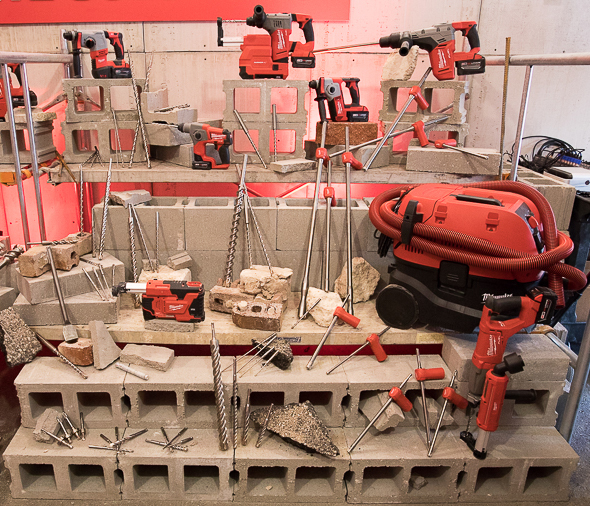 Hilti has been the leader in this space for over 15 years.